Part of the research conducted at the Luxembourg Institute of Science and Technology, and before that in the Public Research Centre Henri Tudor, probes the boundaries of current technologies. As we are oriented towards applied research, it is not uncommon to produce tools and frameworks that will help us in conducting our research and, hopefully, be useful to partners to implement their business plans. TULIP is the result of such a process. The following paragraphs will give a brief history of the framework with the tale of how it came to be together with a brief presentation of team members. Later paragraphs will then deal with concepts and technical details. TULIP was designed and implemented in an iterative process as of 2014. The bulk of the framework has been developed by @etobias with the help of and under the watchful eyes of @vmaquil who heads the research activities in the Natural User Interfaces domain. From January to June 2014 the framework saw the first major developments with some complementary implementation and bug fixing activity done during the Summer and Fall of 2014. In Fall 2014, @yrangoni added the first traces of a lightweight logging library. In January 2015 the project was migrated to Git, using GitLab as a platform. We currently develop an adapter for the computer vision framework and are in the stages of testing it. Similarly, we are developing adapters to address networked devices. TULIP, as of July 2015 is available under an LGPL version 3. We are still actively developing and redesigning parts of the software but feel free to use and contribute TULIP. We welcome any feedback and would love to hear your inputs and experiences regarding TULIP. Currently the project depends on an in-house annotation library that is distributed with this project (licensed under LGPL version 2.1) as well as Guava (licensed under Apache 2.0), JDOM (licensed under an Apache-style open source license), and the TUIO Java client (licensed as LGPL). The network adapters are using [BlueCove] (https://code.google.com/p/bluecove/) (licensed under [Apache 2.0] (http://www.apache.org/licenses/LICENSE-2.0)) for Bluetooth communication and [RXTX] (http://rxtx.qbang.org/wiki/index.php/Main_Page) (licensed as [LGPL] (http://opensource.org/licenses/lgpl-license)) for Xbee communication. 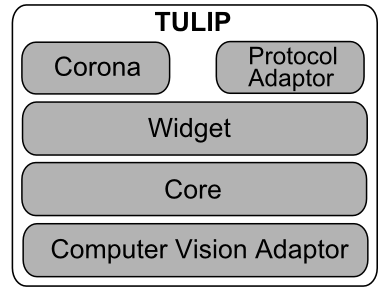 A first paper disseminating TULIP as latest-breaking result at EICS 2015: TULIP: a widget-based software framework for tangible tabletop interfaces. A publication resulting form one of our projects is Tangible Voting: A Technique for Interacting with Group Choices on a Tangible Tabletop. The details of the voting technique have also been filed for patenting: Method for providing data input using a tangible user interface as European Patent with Application Number EP20140174048. We plan on developing an audio feedback dimension that functions similar to the coronas. We also plan to modularise the adapters and distribute them separately so adopters can import only the adapters they need. A joint project with the City of Luxembourg's Centre d'Animation Pédagogique et de Loisirs uses TULIP to provide a Climate Change scenario.